What is Obsidian, How Does it Form, and What is it Used For? Obsidian: The specimen shown above is about two inches (five centimeters) across. The curved semi-concentric ridges are breakage marks associated with obsidian's conchoidal fracture. The rock has very sharp edges. Obsidian is an igneous rock that forms when molten rock material cools so rapidly that atoms are unable to arrange themselves into a crystalline structure. It is an amorphous material known as a "mineraloid." The result is a volcanic glass with a smooth uniform texture that breaks with a conchoidal fracture (see photo). 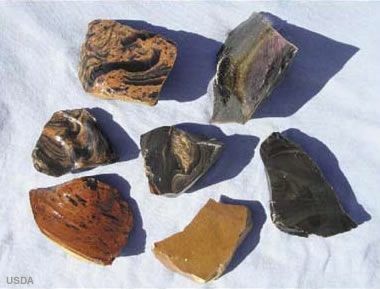 Types of Obsidian: The specimens shown above are from Glass Butte rockhounding site in central Oregon. It shows the diversity of obsidian types that can be found in a small geographic area. Clockwise from upper left are: double flow obsidian, rainbow obsidian, black obsidian, pumpkin obsidian, mahogany obsidian, gold sheen obsidian, and the piece in the center is gold sheen. The nice photo above is from the Glass Butte Rockhounding Site page on the Deschutes National Forest website. Mahogany obsidian: A tumble-polished specimen of "mahogany obsidian." Image copyright iStockphoto / Arpad Benedek. Rainbow Obsidian: A baroque cabochon of iridescent "rainbow obsidian." Black is the most common color of obsidian. However, it can also be brown, tan, or green. Rarely, obsidian can be blue, red, orange, or yellow. The colors are thought to be caused mainly by trace elements or inclusions. Occasionally two colors of obsidian will be swirled together in a single specimen. 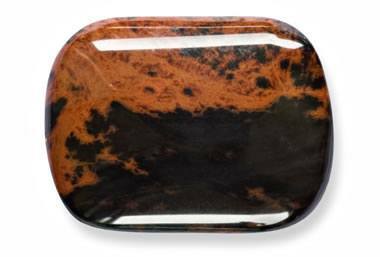 The most common color combination is black and brown obsidian swirled together - that's called "mahogany obsidian" (see photo). 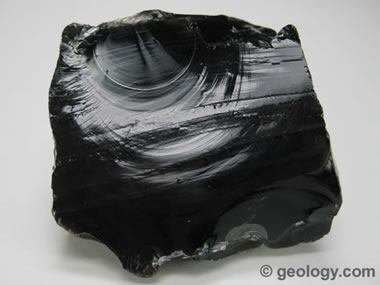 As a "glass," obsidian is chemically unstable. With the passage of time, some obsidian begins to crystallize. This process does not happen at a uniform rate throughout the rock. Instead it begins at various locations within the rock. At these locations, the crystallization process forms radial clusters of white or gray cristobalite crystals within the obsidian. When cut and polished, these specimens are referred to as "snowflake obsidian" (see photos). Rarely, obsidian has an iridescent or metallic "sheen" caused by light reflecting from minute inclusions of mineral crystals, rock debris, or gas. These colored specimens are known as "rainbow obsidian," "golden obsidian," or "silver obsidian," depending upon the color of the sheen or iridescence. These specimens are very desirable for the manufacture of jewelry. 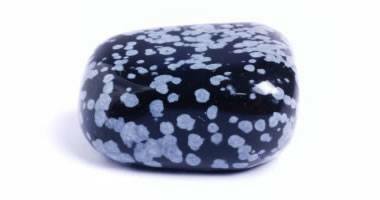 Snowflake obsidian: A tumble-polished specimen of "snowflake obsidian." Image copyright iStockphoto / Martin Novak. What is the Composition of Obsidian? Most obsidians have a composition similar to rhyolite and granite. Granites and rhyolites can form from the same magma as obsidian and are often geographically associated with the obsidian. Rarely, volcanic glasses are found with a composition similar to basalt and gabbro. These glassy rocks are named "tachylyte." Are There Other Glassy Igneous Rocks? Pumice, scoria, and tachylyte are other volcanic glasses formed by rapid cooling. Pumice and scoria differ from obsidian by having abundant vesicles - cavities in the rock produced when gas bubbles were trapped in a solidifying melt. Tachylyte differs in composition - it has a composition similar to basalt and gabbro. Obsidian outcrop: Obsidian along the edge of a lava flow in central Oregon. Image copyright iStockphoto / Phil Augustavo. Obsidian knife blade: A knife blade manufactured from mahogany obsidian. 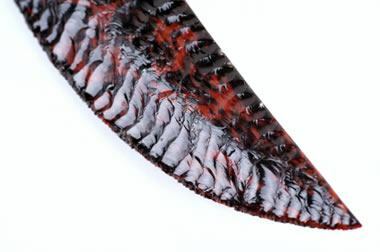 The craftsman who made this blade had a very high skill level and was able to produce a serrated edge. Image copyright iStockphoto / Al Braunworth. Obsidian is found in many locations worldwide. It is confined to areas of geologically recent volcanic activity. 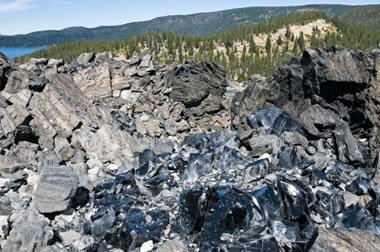 Obsidian older than a few million years is rare because the glassy rock is rapidly destroyed or altered by weathering, heat, or other processes. Significant deposits of obsidian are found in Argentina, Canada, Chile, Ecuador, Greece, Guatemala, Hungary, Iceland, Indonesia, Italy, Japan, Kenya, Mexico, New Zealand, Peru, Russia, United States, and many other locations. In the United States it is not found east of the Mississippi River, as there is no geologically recent volcanic activity there. In the western US it is found at many locations in Arizona, California, Idaho, Nevada, New Mexico, Oregon, Washington, and Wyoming. Most obsidian used in the jewelry trade is produced in the United States. Obsidian spear point: A spear point fashioned from opaque black obsidian. Image copyright iStockphoto / Charles Butzin. 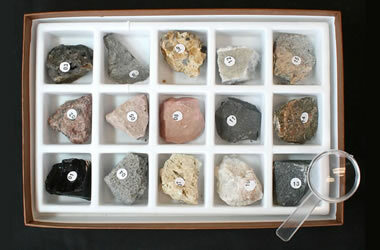 Rock & Mineral Kits: Get a rock, mineral, or fossil kit to learn more about Earth materials. The best way to learn about rocks is to have specimens available for testing and examination. The conchoidal fracture of obsidian causes it to break into pieces with curved surfaces. This type of fracturing can produce rock fragments with very sharp edges. These sharp fragments may have prompted the first use of obsidian by people. The first use of obsidian by people probably occurred when a sharp piece of obsidian was used as a cutting tool. People then discovered how to skillfully break the obsidian to produce cutting tools in a variety of shapes. Obsidian was used to make knives, arrowheads, spear points, scrapers, and many other weapons and tools. Once these discoveries were made, obsidian quickly became the raw material of preference for producing almost any sharp object. The easy-to-recognize rock became one of the first targets of organized "mining." It is probably a safe bet that all natural obsidian outcrops that are known today were discovered and utilized by ancient people. Apache tears: "Apache Tears" is a name used for small obsidian nodules of about one inch or less that can be found in volcanic areas of the southwestern United States. Their name comes from a Native American legend. During a battle between Apaches and the U.S. Cavalry in 1870, the outnumbered Apaches, facing defeat, rode their horses over a cliff rather than allow themselves to be killed by their enemy. Upon hearing the story of the battle, the tears of their family members turned to stone when they hit the ground. Those stones are now found as the black obsidian nodules. People who do rock tumbling often polish Apache Tears. They are difficult to polish because the obsidian chips and bruises easily. Success occurs when they are cushioned during the tumbling with smaller pieces of rough or small ceramic media. The manufacture of obsidian tools by humans dates back to the Stone Age. At some locations, tons of obsidian flakes reveal the presence of ancient "factories." Some of these sites have enough waste debris to suggest that many people labored there for decades producing a variety of obsidian objects. Making arrowheads, spear points, knife blades, and scrapers from obsidian, chert, or flint might have been the world's first "manufacturing industry." Obsidian was so valued for these uses that ancient people mined, transported, and traded obsidian and obsidian objects over distances of up to a thousand miles. Archaeologists have been able to document the geography of this trade by matching the characteristics of obsidian in outcrops with the characteristics of obsidian in cutting tools. A study done by the Idaho National Laboratory used composition studies by X-ray fluorescence to identify the source outcrops of obsidian artifacts and map their use across the western United States. Although using a rock as a cutting tool might sound like "stone age equipment," obsidian continues to play an important role in modern surgery. Obsidian can be used to produce a cutting edge that is thinner and sharper than the best surgical steel. Today, thin blades of obsidian are placed in surgical scalpels used for some of the most precise surgery. In controlled studies, the performance of obsidian blades was equal to or superior to the performance of surgical steel. 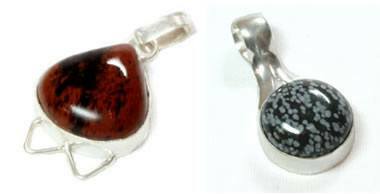 Obsidian jewelry: Mahogany obsidian and snowflake obsidian cabochons set in sterling silver pendants. Obsidian for opal triplets: A thin piece of obsidian is often used as a "backing" material for opal doublets and triplets. The black obsidian adds stability to the opal and provides a dark background color that contrasts with the opal's fire. 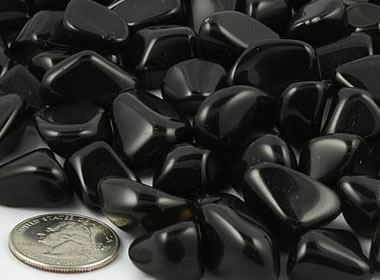 Obsidian is a popular gemstone. It is often cut into beads and cabochons or used to manufacture tumbled stones. Obsidian is sometimes faceted and polished into highly reflective beads. Some transparent specimens are faceted to produce interesting gems. The use of obsidian in jewelry can be limited by its durability. It has a hardness of about 5.5 which makes it easy to scratch. It also lacks toughness and is easily broken or chipped upon impact. These durability concerns make obsidian an inappropriate stone for rings and bracelets. It is best suited for use in low-impact pieces such as earrings, brooches, and pendants. Obsidian is also used in making opal doublets and opal triplets. Thin slices or chips of opal are glued to a thin slice of obsidian to make a composite stone. The black obsidian provides an inexpensive and color-contrasting background that makes opal's colorful fire much more obvious. It also adds mass and stability to the opal that facilitates cutting it into a gem. Freshly broken pieces of obsidian have a very high luster. Ancient people noticed that they could see a reflection in obsidian and used it as a mirror. Later, pieces of obsidian were ground flat and highly polished to improve their reflective abilities. Obsidian's hardness of 5.5 makes it relatively easy to carve. Artists have used obsidian to make masks, small sculptures, and figurines for thousands of years. Rock, Mineral and Fossil Collections.